The 3rd Annual “Cruisin’ for a Cause Boat Run” will be held Saturday, August 20, 2016 (rain date: August 27) on beautiful Lake Greenwood. 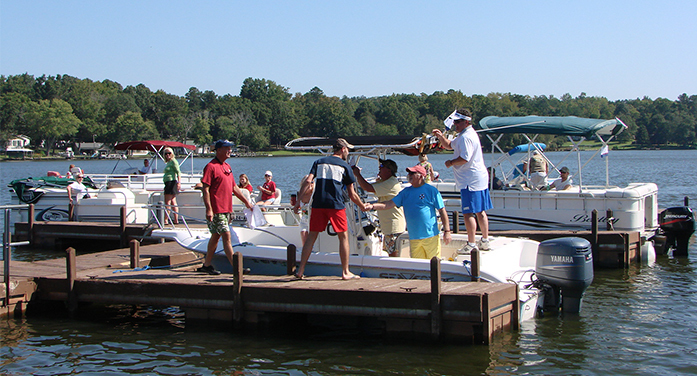 The purpose of the boat run is to bring awareness of people with disabilities and special needs in Abbeville, Edgefield, Greenwood, Laurens, Lexington, McCormick and Saluda counties and funding to help them. The funds raised by this event will go towards providing for wheelchairs, emergency situations, financial hardships, food, clothing, dental care, medical equipment, personal care items, client events and outings. There will be great prizes, food, entertainment and camaraderie. The event begins at 10:30 a.m. at any of the five stops on Lake Greenwood. Last boat in at Camp Fellowship at 3:30 p.m. Auction and prizes will be awarded at 4:00 p.m. Live entertainment featuring, Rhonda McDaniel, Dubie’s Brothers and 3rd Avenue will begin at 2:00 p.m. at Camp Fellowship. Registration: connect lakegreenwood.org; at any of the five stops day of event (Harris Landing; Lake Greenwood Motor Coach Resort; Lighthouse Marina; Skipper’s Landing or Camp Fellowship); by contacting Burton Center, 2605 Hwy 72 221E, Greenwood, SC 29649 or Laurens County Disabilities and Special Needs Board, 1860 Hwy 14, Laurens, SC 29360. For more information please go to: www.connectlakegreenwood.com; www.burtoncenter.org; Laurens County Disabilities and Special Needs Board on Facebook or by calling (864) 942-8900; (864) 981-1926 or (864) 993-0012.